Uncommon map naming the Sea of Korea. Carte de la Province de Quan-tong ou Lyau-tong et du Royaume de Kau-Li ou Coree. 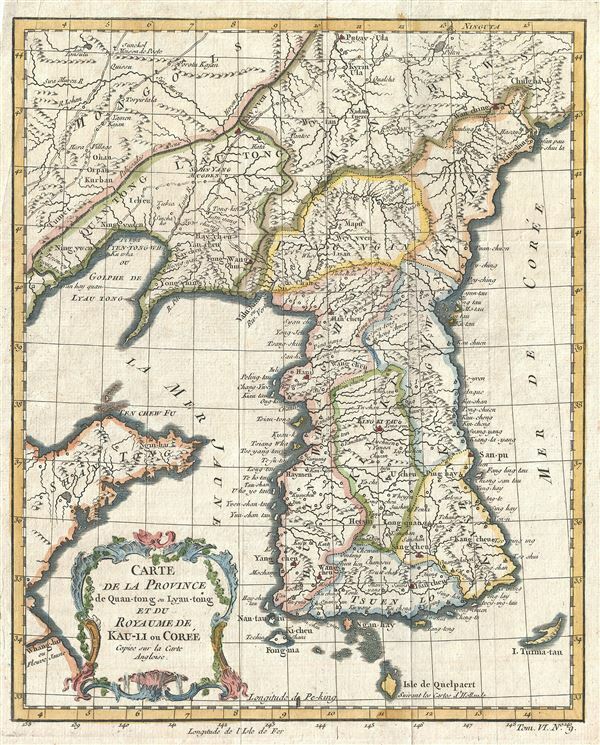 An uncommon c. 1748 map of Korea by Jacques Nicholas Bellin. Centered on the west coast of Korea (Corea), this map covers all of peninsular Korea as well as adjacent parts of Manchuria and China. Korea, as presented here takes on a trapezoidal form with a wide flat base. The map names numerous cities and provinces through Korea as well as noting coastal island and ports. Cartographically Bellin derived this map from an earlier though less specific 1735 map by J. B. B. D'Anville. The detail presented through the the interior makes it clear that D'Anville drew his map based upon Korean sources - a first for a European cartographer. The map changed little under Bellin. Provost, A., L'Histoire Generale des Voyages, (Paris) 1748. Very good. Original platemark visible. Minor wear along original fold lines. Blank on verso. University of Bern, Central Library, Ryhiner Collection, ZB Ryh 8401 : 9 B DSV0705415.